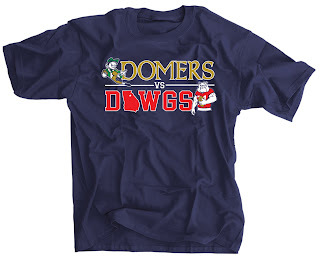 Domers Vs Dawgs Shirts Now For Sale! September 9th can get here soon enough. Georgia will be traveling to historic Notre Dame stadium for the first time in program history to face the Fighting Irish. In fact it's only the 2nd time these two programs have ever faced each other. The first was way back in 1980 in the Sugar Bowl when Georgia led by legendary tailback Herschel Walker held on for the win and the National Title.